The Education Resource Information Center (ERIC) provides access to educational literature and resources. This database provides access to information from journals included in the Current Index of Journals in Education and Resources in Education Index. Contains more than a million records and links to hundreds of thousands of full-text documents from ERIC back to 1966. The default search mode in ERIC is Basic Search. You can access some of the database’s search features, such as Full Text, Date Published, and Intended Audience by clicking on the Search Options link underneath the main ERIC search box. Use Advanced Search to access additional search features. Look for the Advanced Search link underneath the main ERIC search box. You can switch to Advanced Search before or after you do a search. One of the most helpful features in ERIC’s Advanced Search is Educational Level. Levels on the list are arranged in alphabetical order. Depending on the focus of your research, you may want to select multiple levels on the list. For example, if you were researching middle school students, you might want to select most or all of the following Educational Levels: Grade 5, Grade 6, Grade 7, Grade 8, Grade 9, Intermediate Grades, Junior High Schools, and Middle Schools. To select multiple levels, hold down the CTRL button on your keyboard when you click on each level you would like to include in your search. One of the most powerful features of this database is the ERIC Thesaurus, which contains a controlled vocabulary of education-related words and phrases that represent the content of each document in the database. Every document in ERIC is assigned a number of subject terms, or descriptors, from the thesaurus; each descriptor represents one concept. The database will look for your search terms in more places than just the subject — it will search in the title, abstract, etc. Keywords are based on natural language, which is more flexible. The database will only retrieve results in which your search terms are key concepts. You don’t have to think of all the different ways a concept may be described. To access the ERIC Thesaurus, click on the Thesaurus link in the top left corner of the database page. The search box at the top of the page will search the entire ERIC database. Look for the search box below labeled Browsing: ERIC — Thesaurus. To search the ERIC Thesaurus, first determine what the major concepts in your research topic are. For example, if you are researching how a student’s home life can impact his/her level of academic achievement, you might decide that the major concepts are home life and academic achievement. Type your search terms into the search box and click Browse. Note: The default search mode for the ERIC Thesaurus is “Term Begins With,” but if you don’t get the results you’re looking for, you can try the “Relevancy Ranked” search option. 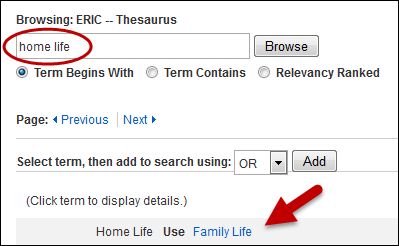 In this case, Home Life is not an ERIC Thesaurus term but the database tells you what subject term to use instead — Family Life. Each ERIC Thesaurus term is a link; click the link to view more details about that subject term. To search ERIC using your thesaurus term, check the box to the left of the term and then click the Add button. If you look at the main ERIC search box near the top of the page, you will see that your thesaurus term has been added. 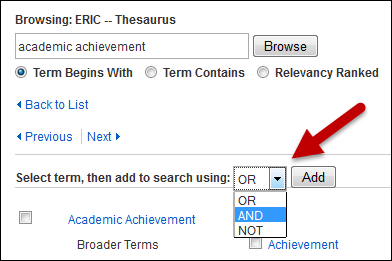 Use the ERIC Thesaurus search box to look up and add other subject terms as necessary. It’s best to start off with around two subject terms and then add more later if you need to. If your subject term has narrower terms in the thesaurus, you have the option to Explode that thesaurus term, which means that the database will search for not only your subject term but any narrower terms as well. To “Explode” a subject term, check the box on the right side of the term. Use AND to connect *different* concepts. Use OR to connect *similar or related* concepts. Using NOT is very tricky and usually not necessary. You can also combine thesaurus terms with keyword searching. Use Boolean operators to connect your search terms together. If a search gives you too many results, you can use ERIC’s database limiters to refine your search results. Use the options on the left side of the search results page to limit your results by Full Text, Peer Reviewed, or Publication Date. Click on Advanced Search underneath the main search box to access additional limiters such as Educational Level.